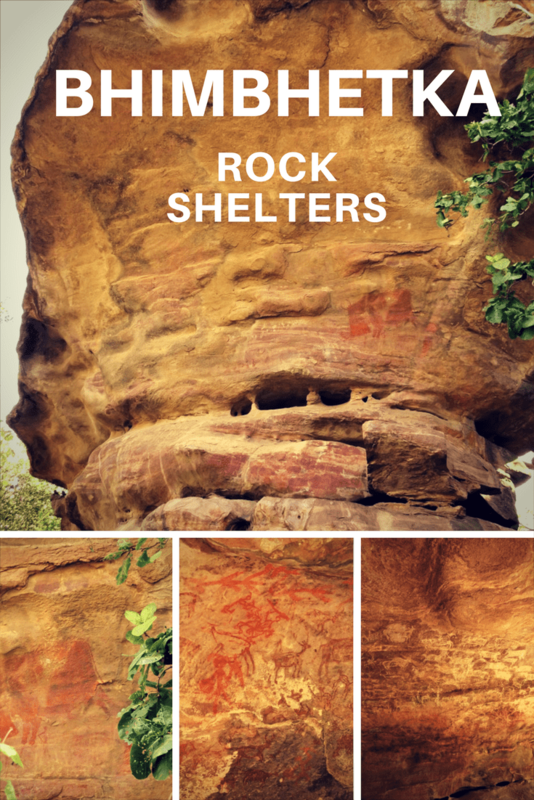 About 45km from Bhopal lies the greatest historical site where may be direct descendants of Adam and Eve lived and decided to draw their lives on the walls of the rocks. 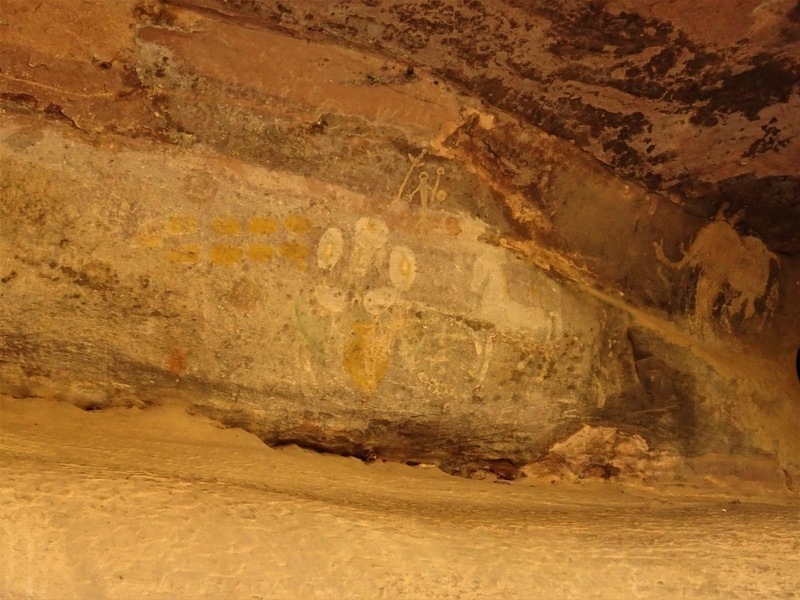 And over thousands of years these paintings are still intact leaving us a rich heritage to look up to and learn the lifestyle of these cave men. 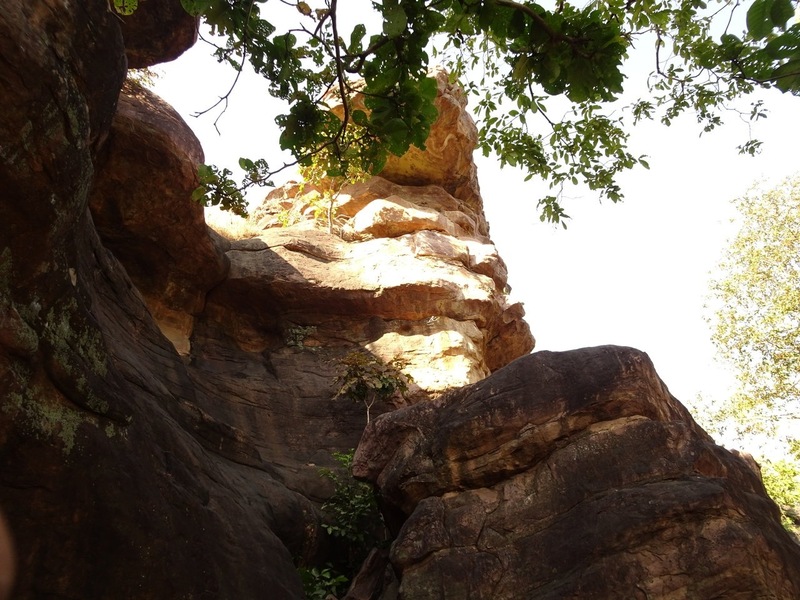 Bhimbetka caves! 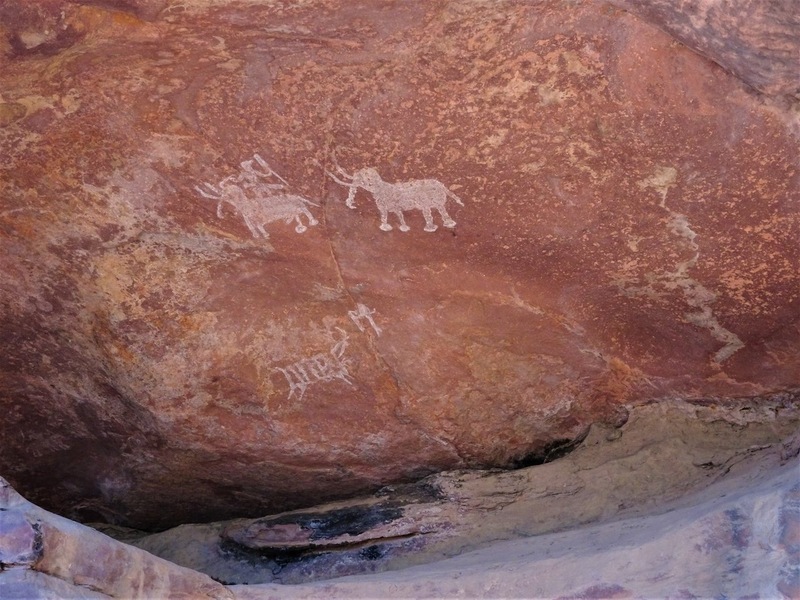 Though the caves are famous for their rock paintings, it got the name as Bhimbetka because Bheema, one of the five Pandava brothers, lived here during exile. Walking through these caves throws light on the evolution of mankind and it cannot get more interesting than to know how we evolved over years. This might sound like history class but believe me I knew only Ice Age and Stone age till I was here. Apparently there is more to these eras than I thought. It is actually not historic but pre-historic.. Once the Ice age was done starts the stone age. The stone age itself has three different times. Paleolithic aka Old Stone Age, Mesolithic aka Middle stone age and then comes the Neolithic aka New stone age. As we move from Old to New age so does our evolution, culture, domestication, etc. During the Paleolithic age, it was the end of ice age and the stone age begins. The world is warmer, there are caves to live and it is also said that this is when modern homo sapiens evolved. Meaning we started to be like humans. We are still hunting animals, eating raw food, living in small communities, following herds of game animals to hunt them, use simple weapons like bow arrow or stone and lived a nomadic lifestyle. Then we move into Mesolithic where we advance into living a community lifestyle. We start to domesticate animals, rear cattle, goats, pig, etc. We are still hunting animals but domestication of animals has begun. There is significant improvement in the tools we use. Climate has become warmer. This is basically a transition into the Neolithic era. Neolithic is when we try to settle down at a place and build shelters. Community living has grown. We have learnt to dress. We start agriculture and farming has also become a source of food for us. Raising goats and cattle and using them for ourselves has become routine. The tools used show that we are heading towards civilization, there are cups, plates, ladles and hunting tools have become defined and not crude. We have started making clothes too. 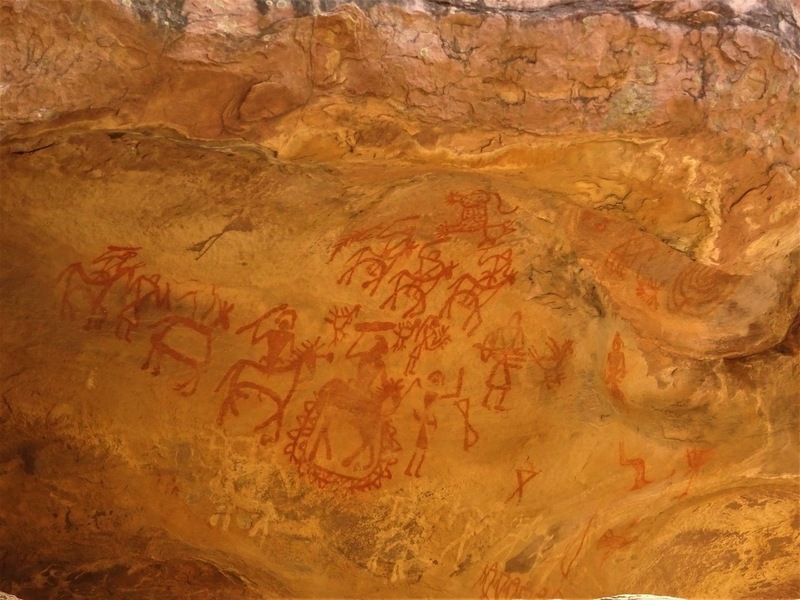 At Bhimbetka we see human settlements as far as from the paleolithic age. 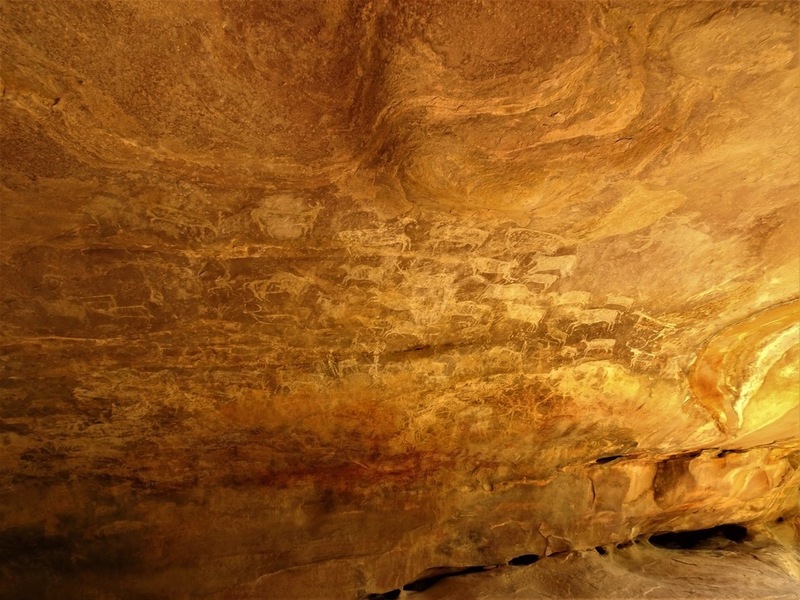 Evidences show that Bhimbetka caves served as shelters for more than 1lakh years. From paleolithic to even medieval period humans have stayed here. 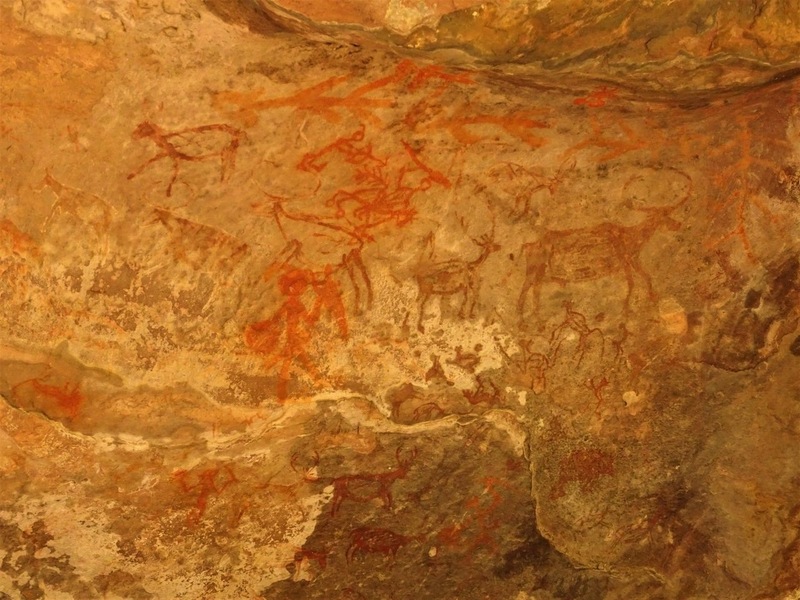 We get to know how the evolution moved through the different stone ages by seeing the paintings on the walls. 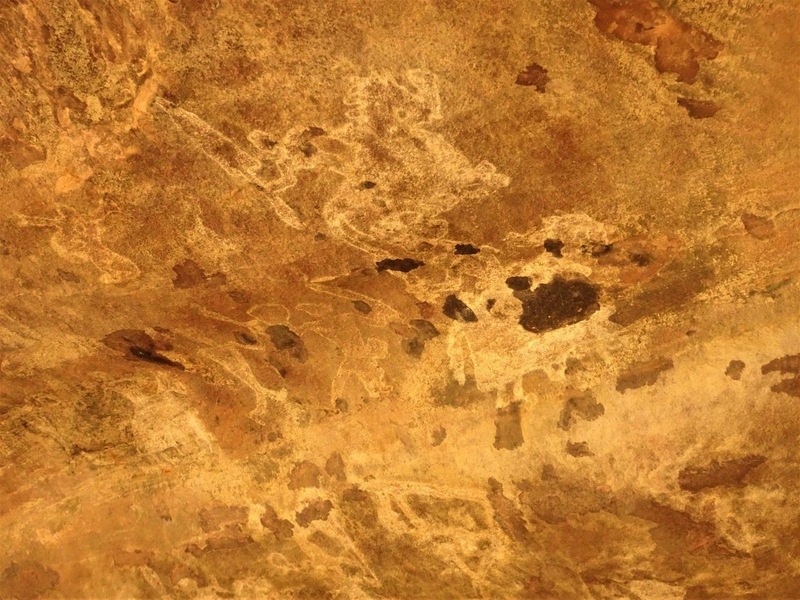 These cave paintings are made with natural colors that has survived through time and weather. 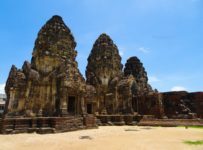 The colors were obtained from lime stones, iron ore, burnt bones, blood, vegetable juices mixed with animal fat or spit that helped for the color to retain on the rocks. Over years subsequent generations also drew over the figurines again and again that layers of paintings made it thick. The paintings were made using fingers, feathers, hairs, brushes made of horse hair depending upon the era they were from. 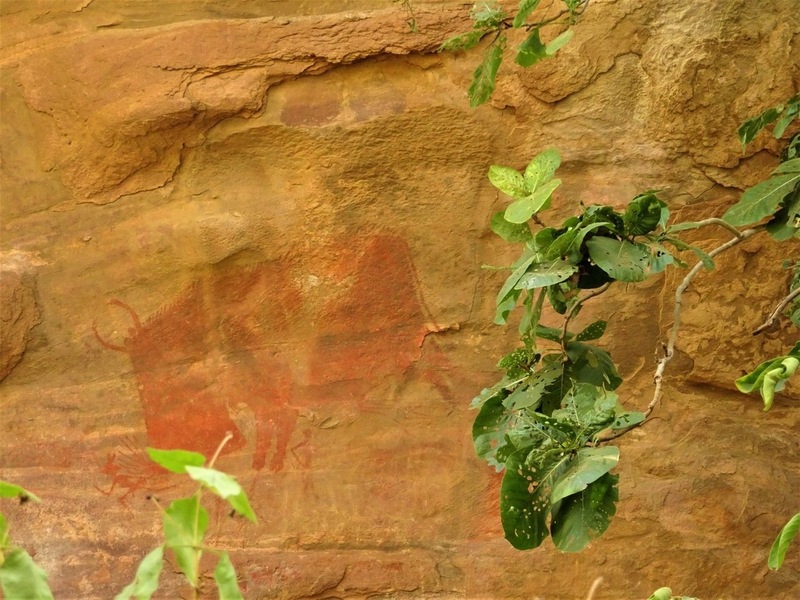 And guess what the paintings from Paleolithic are cave paintings where as the ones from Mesolithic are rock paintings. Wondering what the difference is? Well mesolithic, the world is warmer, the paintings dry quicker and so done on walls of the rock. Where as paleolithic in order to protect the painting and more importantly since they stayed only inside caves the paintings are seen in caves. The other way to identify the paintings from the mesolithic era is that the humans are more represented in the form of stick figures. 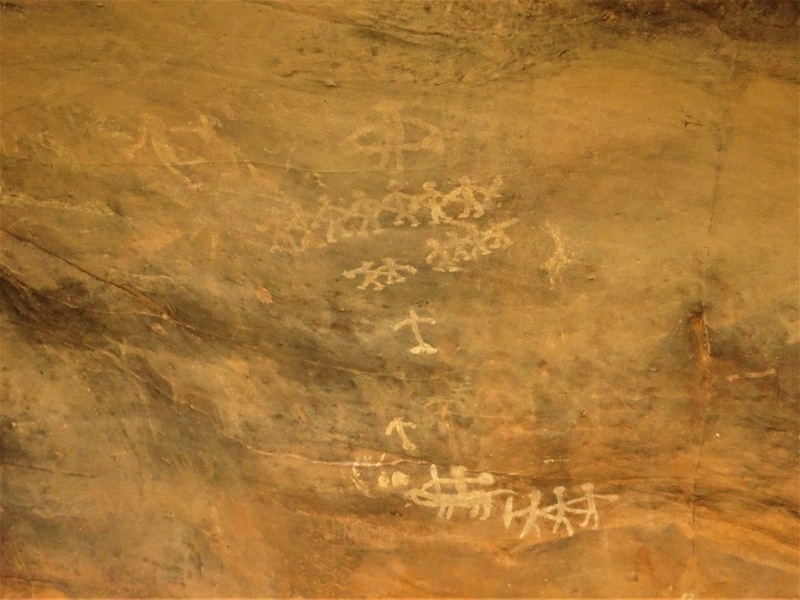 Now that we know about our ancestors, let’s walk through the bhimbetka cave. The first painting we see. A man on top of what looks like an elephant. The tool in his hand is crude and not so well defined. Cattle Breeding. Below is a row of not so clear set of paintings that can be noticed in red color. This shows super imposing of paintings from different eras. A very good representation of the Mesolithic era. The figurines are like stick figures. It is a war or battle or fight scene. 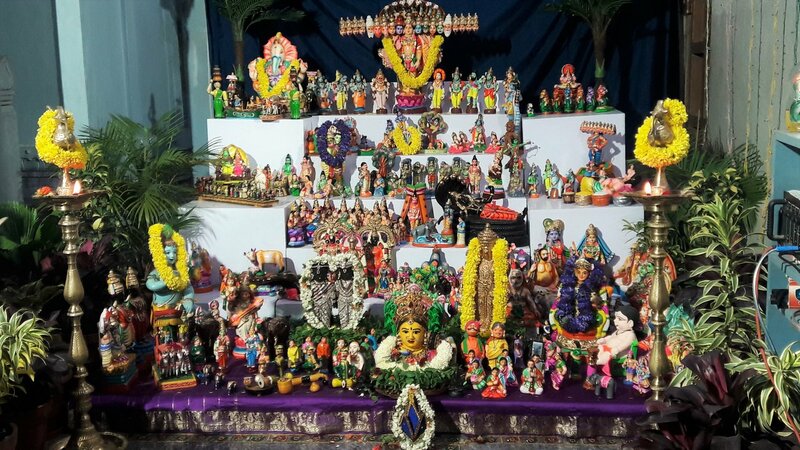 It also shows community is more defined, we can see a chief sitting on top of decorated horse. This one could be from Medieval era. Colors like yellow and green are used. Also check how the curves of the horse are beautifully drawn. It is more well defined. Another area of the cave where we can see paintings from two different era. 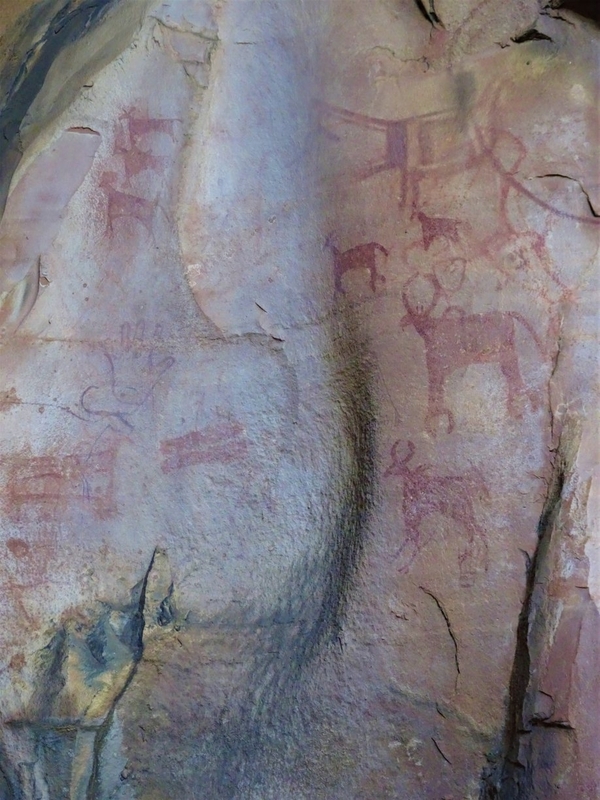 The old stone age, the painting has kind of worn out. The weapon on the hand of the man on horse is made of stone. Hunting scene where men are trying to bringing down a Boar. Community living – on top is a guy playing an instrument. In the middle are group of dancers and in the down again we can see people playing instrument. The caves are pretty isolated and it looked like having your own vehicle is the only choice of reaching the place. 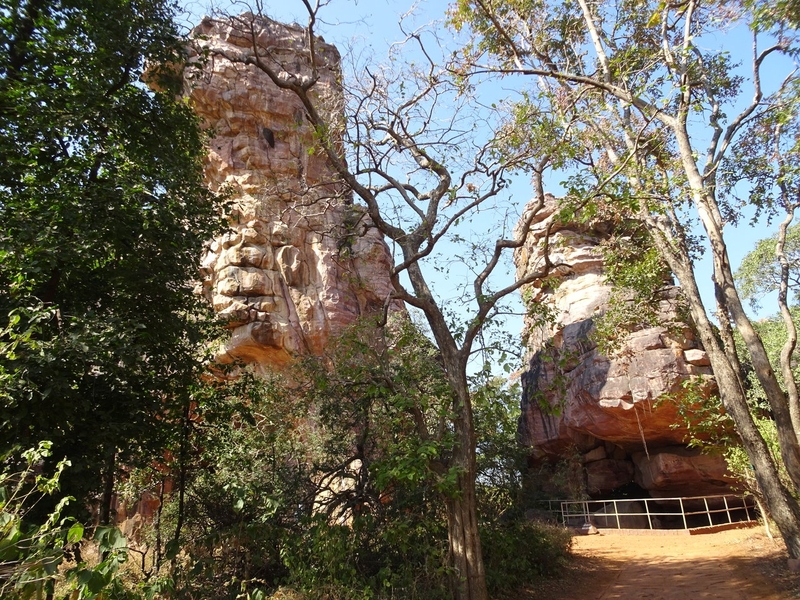 The content of this blog is based on the information boards placed in the caves and from the guide whom we had hired. If there are more stories to add behind these paintings or if there are any corrections, do add them in the comment section.